Designers who use LIRA-SAPR software are now able to design and analyze basalt rebar reinforcement. Currently, this software package operates with two classes of nonmetallic composite basalt rebar – ANPB 800 and ANPB 1000 produced by Technobasalt: they can be used only for longitudinal reinforcement. 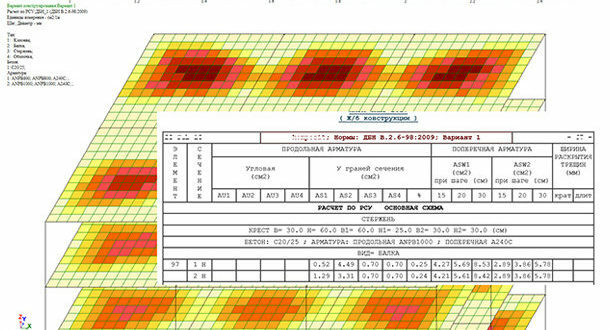 Design and analysis are performed in accordance with DSTU – Н Б В. 2.6-185: 2012, according to the norms DBN B.2.6-98: 2009; and, as for composite rebar reinforced concrete products – according to SP 63.13330.2012. Concrete and reinforced concrete structures. Basic provisions. Appendix L. (R2). LIRA-SAPR software package was developed by Ukraine-based LiraLand GC, which implements Building information modeling (BIM) and works with a number of integrated SAPR systems. 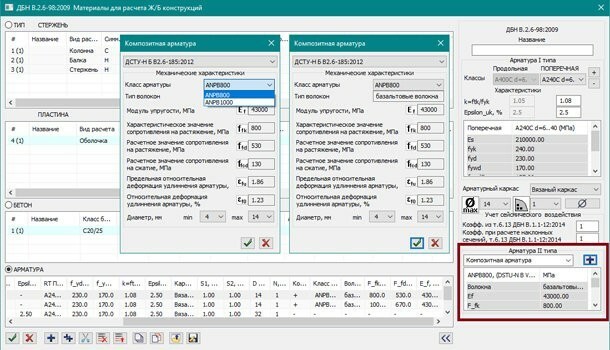 Software package LIRA 10.x from Russia-based LIRA Soft also provides an option of designing parameter checkout / selecting of reinforced concrete sections using composite polymer rebar (CPR) according to the provisions set forth in SP 63.13330.2012. This system gives an option to select basalt rebar produced by Galen. Spokespeople from the company commented that the next software packages might include products of this brand if manufacturers provide the necessary data.